Featured as an “Artist to Watch” on the cover of the January 2007 issue of SYMPHONY Magazine, violinist Michi Wiancko has appeared as a soloist with orchestras including the New York and Los Angeles Philharmonics and in recital and chamber appearances throughout the country. Michi is a member of the Los Angeles Piano Quartet and has toured with Musicians from Marlboro several times. 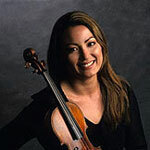 She is also a co-founder of the ECCO (East Coast Chamber Orchestra), a conductorless string ensemble. An artist with a unique vision and deemed “Pure Gold” by The Des Moines Register, Michi has performed in venues such as Carnegie Hall, Library of Congress, Banff Center, Sydney Opera House, Frick Center, National Gallery, Metropolitan Museum of Art, Isabella Stewart Gardner Museum and the Philadelphia’s Kimmell Center. An expansive musical personality, she also performs regularly in alternative spaces and with non-traditional ensembles. To check out her non-classical project, Kono Michi, for which she sings, plays, and composes, go to: www.myspace.com/konomichi. To read Michi's full bio, please click on her website page link. 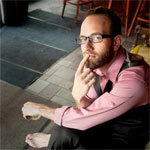 9:30 - Cross-Pollination set ft MICHI WIANCKO & MATT SINGER! !